Due to typhoon Lupit predicted to hit a hard landfall on northern Luzon, the organizers and performers for the Reading Festival (First Leg) decided to postpone the events slated in Laoag October 23 and Vigan October 24. The SM City Rosales (Pangasinan) slated October 25 was canceled in an earlier date due to venue flooding. The Office of the Governor (Michael M. Keon) of Ilocos Norte through Ms. Sunny Miguel has agreed to provide the Centennial Arena for the postponement to be held October 31 instead, from 2 pm onwards. A public school pupil is lucky enough when he or she gets a book issued by the DepEd every school-year opening. Usually, the priority are pupils from the "star" section or where the best of the crop are grouped together. If a pupil belongs to the lowest section, or any of the lower sections, books become scarce, with street dog-eared or missing pages, torn cover and pages. Those who get a complete set is the luckier bunch. There are those who get two, three, or four books out of seven or eight textbooks. The squalid state of the books could make any one despair. After typhoon Ondoy, many schools were flooded and adversely affected. 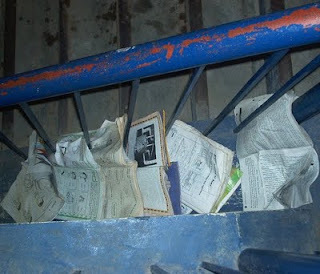 Here, the the books are dried inside school grounds--- in the stairs, corridors and inside the school perimeter fence. 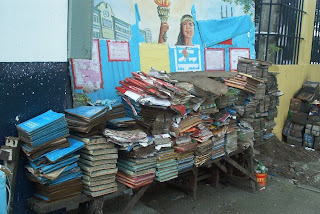 These books represent the state of Philippine education and literacy. This is the main reason why Reading Festival was conceived. Through our reading and literacy campaign, we hope to impart that every individual has his and her own responsibility to provide for our environment, to help ease the impact of chaos our environment is going through by lessening our carbon footprint.